Young Pannalal was highly receptive and absorbed good music from various sources. It appears that during his young days at Barisal, Pannalal was active in the freedom struggle. He came to Kolkata during late 1920's, thereafter shifting to Mumbai (1940) in search of better prospects for his musical career. It was in no time that the nation recognized the maestro in him. His fame and popularity transgressed linguistic and cultural boundaries. Pannalal Ghosh resided in Mumbai till 1956, before making Delhi his final destination, where he passed away on 20th April, 1960. At Kolkata during the early 1930s, Pannababuji received musical training for two years from his first Guru, the noted harmonium player and a renowned master in classical music, Ustad Khushi Mohammed Khan, under the traditional Ganda Bandhan form of tutelage. After the sad demise of Khushi Mohammed Khan, Pannababuji studied under Pt. Girija Shankar Chakraborty, an eminent musician and musicologist. 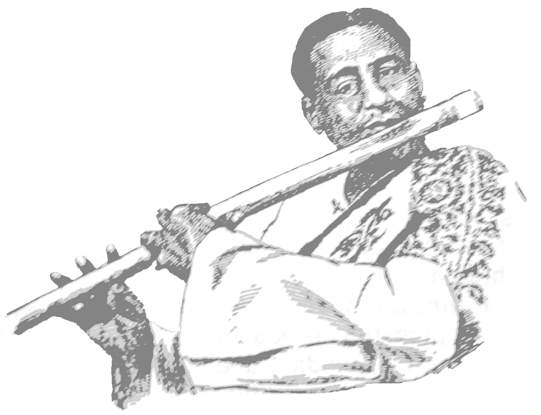 Pannababuji was influenced by the style of Ustad Abdul Karim Khan Saheb initially. The strongest influence on Pannababuji's music came from the systematic lessons under the legendary Ustad Allaudin Khan Sahib, from the 1947. Pannalal Ghosh, as the music director of the dance troupe of the princely kingdom of Seraikela state, visited and performed in Europe in the year late 1930's, and was one of the first classical musicians to have crossed the boundaries of India. After joining All India Radio, Delhi, as the Conductor of the National Orchestra in 1956, he composed several path-breaking orchestral pieces including Kalinga Vijay, Rituraj, Hariyali and Jyotirmoy Amitabha. His contribution in semi-classical as well as film music also was equally important, and his name is permanently linked to many famous movies such as Anjan, Basant, Duhai, Police, Andolan, Nandkishore, Basant Bahar, Mughal-e-Azam and many more.